Alaska is a destination that begs to be explored. Whether you seek a mountain getaway, to walk through uncultivated wilderness, or commune with wildlife in its natural habitat, Alaska awaits your discovery. Here are a few reasons to lace up your hiking boots and head out to explore. 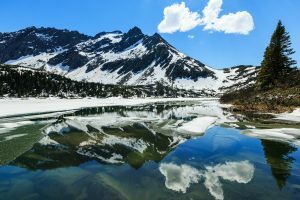 Though there are several other states in the U.S. with beautiful National Parks and natural preservation sites, few compare to Alaska in terms of untamed wilderness. There is more than 580,000 square miles of land in Alaska but only 20% that is accessible by a road. That means that the other 80% is untouched wilderness awaiting exploration. Alaska is home to a number of mountains, including the highest peak in North America. Mount McKinley reaches a whopping 20,320 feet at its zenith. There are day cruises, helicopter tours, trams and trail tours available to explore the mountains. Whether guests seek to explore Mount Roberts in Juneau, Mount Alysa in Girdwood, the mountains of Chugach State Park, or Mount McKinley, guided tours are available and await your arrival. The coastline of Alaska is roughly 6,500 miles long and borders the Arctic Ocean, Beaufort Seata, Chukchi Sea, the Pacific Oceans and the Bering Strait. It is home to a variety of fish and marine mammals that live on and in the coastal waters. Sure the Northern Lights can be seen from other locations around the world, but nothing compares to seeing them in Alaska. The best time to view the lights is anywhere from September through the end of April when the weather is at it coldest and the lights are their most colorful. Fairbanks is said to be a prime spot for viewing as the town is located under the “aurora oval,” where the lights appear most frequently. This phenomenon occurs during the summer months in areas close to the Arctic Circle when the sun remains visible to visitors and residents for a full 24 hours. Most of Alaska experiences this on the summer solstice, however the small town of Barrow gets continuous daylight for nearly two months during the summer and a corresponding lack of it for two months in the winter.